My Clothespin Witch Brigade sold for a mere $15 in 2010. I am still learning how to price my creations. 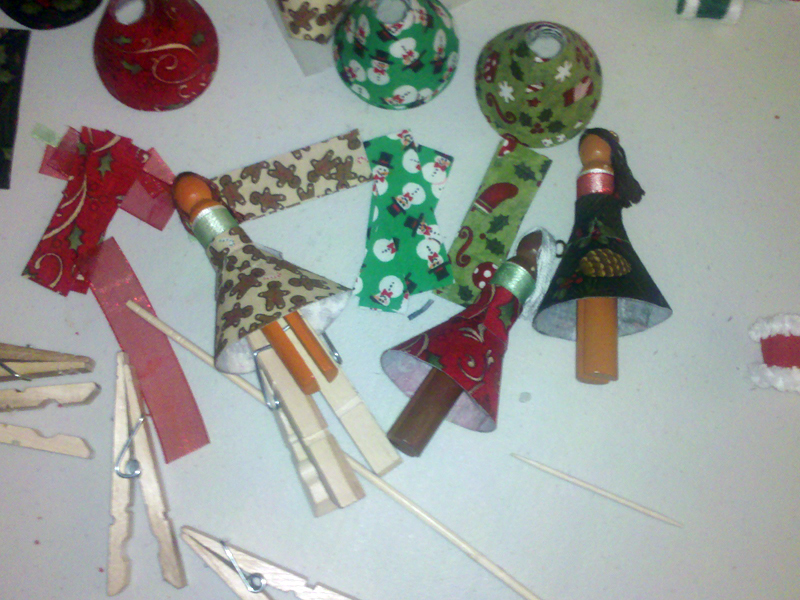 Last year I made these fun little clothespin dolls for Halloween and charged, like, fifty cents for the set of five. They were time-consuming and awesome, but I might as well have given them away, and many people asked when I was going to make more. I’ll get there y’all — keep your shirt on and calm the heck down. First, I have Christmas to think of. Designing these holiday dolls is the easy part. Assembly is something else entirely. One major thing I learned with the Halloween dolls is that the devil is in the details. Sure I picked out the color scheme and the fabrics and the general outfit design, but I didn’t get around to assigning colors, fabrics, or any other details until I had all the parts collected in front of me. Who gets the chestnut hair? Who gets the pumpkin fabric? Planning seems like a no-brainer, but I wasn’t there yet. I was still in the mindset that I am the artiste, I will go where the creativity takes me! What a crock of balderdash. Plan the design. Plan the crap out of it. Glue. Believe it or not, it's less time-consuming than sewing al these pieces together. After a few of these skirts were attached I had to file down the insides of the spring clothespins and wrap them in tape to keep them from sticking to the wrong things and mucking it all up. Remember my last post? The one with the colored pins set next to the ribbons and the fabrics? That’s me fiddling about with the design details, and it still isn’t final. I thought I had it all figured out. The end product turned out fine, but not perfect. I kept looking at the dolls next to each other and thinking the colors weren’t balanced enough. Too much green here, not enough light color to balance the dark there, that kind of thing. I still have three sets left to assemble. No two sets will be exactly the same because I am still working out the colors to my satisfaction. As of this writing the first set of Christmas dolls are DONE. I have added all the little bits and pieces I am going to, cleaned up the excess glue goobers, and inspected them all for anything else that might not make them perfect. If you love them and want them, they’ll be on my Etsy store this weekend. If you love them, want them, but someone else beat you to them… give me a day or two. Like I said — there are three more sets left to do. I will be listing them over at waywardclay.etsy.com in the next several days. The dolls in this pic are not 100% complete. If you want to see the finished product, keep an eye on waywardclay.etsy.com for the listing. Look real close and you can see my original design sketch in the background. Once these are complete I won’t make any more until 2012. Halloween is not too far off, though. 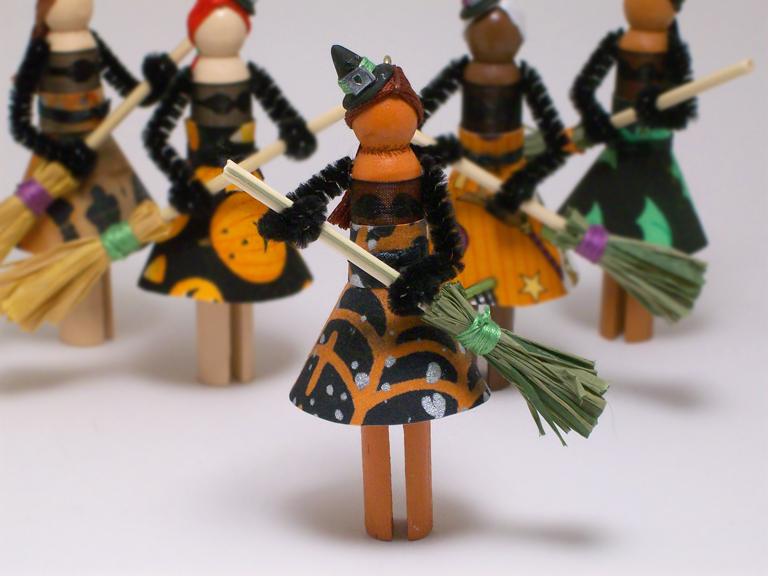 While I still have the clothespin decorating bug I’ll likely make more sets of the witch brigade dolls. We’ll see. Posted in Craft and tagged dolls. Bookmark the permalink. Lordy, I’m awful at this. Currently I am knee-deep in prepping Christmas inventory for my Etsy store and any possible craft fairs I might weasel my way into. This involves finishing half-done projects as well as putting together new ones I know will sell. A normal person would probably tackle the incompletes first. Me, I’m not exactly normal. I started my new projects knowing that I risk having more incomplete ones by showtime. It seems that when I went over my existing inventory I discovered I had a good fifty completed pieces that weren’t listed in my Etsy shop. I’d add a dozen more if I finished my half-baked items. I can't call these "muffs" without giggling, so they are officially "hand warmers." I originally planned on using fluffy yarn to embellish them (on the left up there) but it didn't look right. I added to my challenge by attempting to take pictures of all the steps in my process. Will I do one post or several? What would be more interesting? As time went on I realized I wasn’t terribly consistent in my picture-taking and ended up missing more interesting details. Sure, I got some good shots of major milestones, but I was really hoping to post a more thorough account of the project from start to finish. Did I want to share my design secrets with the internet? Not really, but I did want to show that my simple creation wasn’t as simple to make. Plus, I just think craft blogs with lots of pictures are totally neato. I want my blog to be totally neato, too. These were a process. Roll the felt, glue the felt, reinforce with stitching, cut more felt for the trim, glue the trim, reinforce with stitching... I got through three episodes of The Tudors this way. To get a little closer to neato I’m posting pictures anyway. 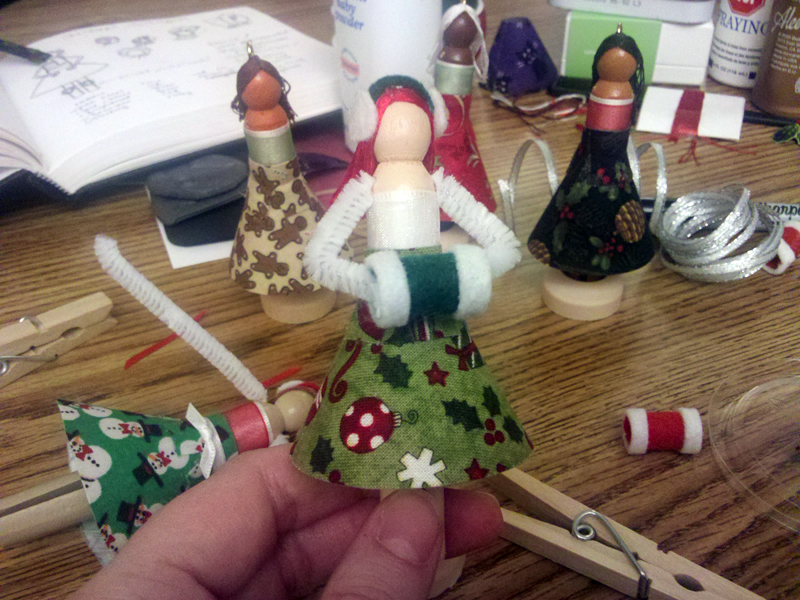 The images here are from the beginning of my Christmas Clothespin Brigade – five little feminine figures in holiday themed dress inspired by a Halloween set I sold last year. The last thing I photographed were steps for the embroidery floss hairdos, but those are on my camera. The ones here are from my phone. I will make four sets of these dolls. If I finish them quickly I will also make more Halloween ones. Why not do the Halloween ones first? Well, probably because I already know how to make those and can skip the learning curve. They’ll go faster. A little bit of craft glue on one edge goes a long way. Too much and it will goop everywhere. In the background you can see a few completed skirts. I’m still getting the hang of this WordPress thing. When picture content outweighs text it’s hard to arrange everything so it looks all slick and professional-like. If you scroll down further you’ll see a couple more pictures. It’s the most I can do at this point since I’m out of words and need to get back to actually working on them instead of writing about them. Craft glue is not an instant stick and has to be held in place. Some modified spring clothes pins did the trick. I got these "multicultural clothespins" on clearance at Michael's and am now kicking myself that I didn't buy all the packages on the peg. For the colored clothespin dolls these are the fabric/color combinations. The rest of the sets will be on unpainted clothespin bases. I am debating painting those just to be consistent, but worry that may be in poor taste. Posted in Craft, Uncategorized and tagged dolls. Bookmark the permalink.